Until the expansion of the motor car in the beginning of the 20th century, the main mode of transport on land remained the horse. The extent to which horse riding remains popular can be seen by the demand for hunting and equestrian articles at auction. Charles Johnson Payne (Snaffles) (1884–1967) The Gent with Rat catcher (SC21/500). Riding boots, saddles and tack from the early 20th century is desirable for the quality of the craftsmanship. 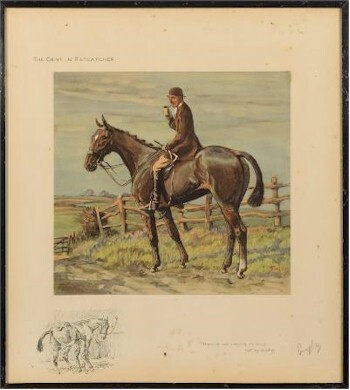 A good pair of riding boot will fetch £40-£60 at auction, as will a good bowler hat. In the case of the riding boot and the bowler hat, the larger the size the better, with extra large bowler hats fetching £200-£250 at auction. Riding crops and riding whips were often given as presents or presentation pieces during the Victorian and Edwardian period. Good silver mounted riding whips by makers such as Swaine & Adney start from £50-£70 for a plain example up to £200-£300 for an engraved, silver-mounted riding whip. Many of the accoutrements used for riding such as boot pulls, hunting flasks and stirrup cups were made by the silversmiths of London, Birmingham and Sheffield at the turn of the century. These pieces were, perhaps, everyday practical items to riders during the period, but are now prized by collectors. A pair of silver-handled boot pulls can be obtained for £60-£100; a stirrup cup, £100-£120; and flasks, a similar figure.